With the Corner House Cafe remaining firmly shut on Fridays, we're starting to wallow in the shallows of the 'Stowe light lunch list. Q: if you're sitting in The Conservatory, The Little Ice Cream Co. or Joe Crowley's, what's staring you in the face? 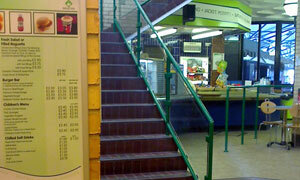 A: today's unlikely venue, the Leisure Centre Cafe. Can't be too many eating establishments which demand an entrance fee. We pooled our resources and each splashed out a 75p "spectator fee" to gain admittance. Good news is that it's refundable against your food & drink, thus turning a 95p cup of tea into a 20p cuppa, if Grenvyle is to be believed. Baguettes / burgers / salads on offer. Oh, and handmade birthday cards, unnaturally. Tick for including a children's menu. You could have a jacket though it's already plenty warm enough in here. Seating is either (a) behind the glass, protected from droplets, or (b) through the looking glass, enjoying Maureen's chlorine. We went waterside. Short wait for my chicken burger -- pure breaststroke -- with untouchably hot chips and thirst-quenchin' Pepsi. Welcome burst of colour from the small side salad medley, featuring a nano-thin red onion slice of a rather Goodhew. Driver enjoyed his pot of tea plus Ginsters prepacked prawn sarnie, then found enough flume for a cheese & ham toastie. Recalled how I felt after overdoing it at the Cliff Top Tea Rooms -- since last week, my knowledge of what my stomach can stand has deep end -- and so ignored the various prewrapped muffins and choccy bars crying out to me. No handmade sponges obviously on show, not even a butterfly bun. If it was a car -- Rinspeed sQuba. If they were passing by -- David Wilkie.